Ann has been owner of Yoga North studio since December 2001. 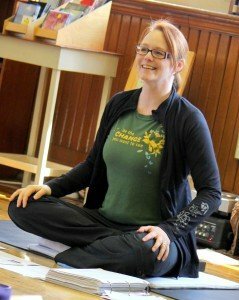 She holds a masters degree as well as certification in Hatha Yoga, Yoga for Cancer Survivors and is an experienced teacher trainer and yoga therapist. She gets great satisfaction in supporting the teachers in training to find their niche, grow their skills and become great yoga teachers and therapists. She lives on the edge of the wilderness in Yoga North’s retreat center on Jasper Lake in Ely, MN. Ann brings the spirit of adventure and curiosity to her expertise as a yoga instructor and business owner, grounding her ability in the practicality and expertise of the body. Ann is a model of yogic living for her students and brings a sense of wisdom and fun to the daily practice of yoga.